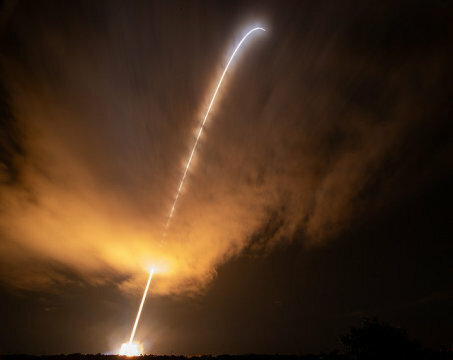 The United Launch Alliance Delta IV Heavy rocket is seen in this long exposure photograph as it launches NASA's Parker Solar Probe to touch the Sun, Sunday, Aug. 12, 2018 from Launch Complex 37 at Cape Canaveral Air Force Station, Florida. Parker Solar Probe is humanity's first-ever mission into a part of the Sun's atmosphere called the corona. Here it will directly explore solar processes that are key to understanding and forecasting space weather events that can impact life on Earth. Hours before the rise of the very star it will study, NASA's Parker Solar Probe launched from Florida Sunday to begin its journey to the Sun, where it will undertake a landmark mission. The spacecraft will transmit its first science observations in December, beginning a revolution in our understanding of the star that makes life on Earth possible. Roughly the size of a small car, the spacecraft lifted off at 3:31 a.m. EDT on a United Launch Alliance Delta IV Heavy rocket from Space Launch Complex-37 at Cape Canaveral Air Force Station. At 5:33 a.m., the mission operations manager reported that the spacecraft was healthy and operating normally. The mission's findings will help researchers improve their forecasts of space weather events, which have the potential to damage satellites and harm astronauts on orbit, disrupt radio communications and, at their most severe, overwhelm power grids. "This mission truly marks humanity's first visit to a star that will have implications not just here on Earth, but how we better understand our universe," said Thomas Zurbuchen, associate administrator of NASA's Science Mission Directorate. "We've accomplished something that decades ago, lived solely in the realm of science fiction." During the first week of its journey, the spacecraft will deploy its high-gain antenna and magnetometer boom. It also will perform the first of a two-part deployment of its electric field antennas. Instrument testing will begin in early September and last approximately four weeks, after which Parker Solar Probe can begin science operations. "Today's launch was the culmination of six decades of scientific study and millions of hours of effort," said project manager Andy Driesman, of the Johns Hopkins University Applied Physics Laboratory (APL) in Laurel, Maryland. "Now, Parker Solar Probe is operating normally and on its way to begin a seven-year mission of extreme science."